Shown from left in the foreground are council members Mary Stanforth, Claudia Klein, Ann Morris, Wendy Culbreath and Adam Wilkin. Shown in the background, from left, are council President Lee Koogler and Clerk Heather Collins. Hillsboro City Council on Monday heard a first reading of an ordinance that would allow city residents to sue drug dealers if they experience monetary loss or injury due to illicit drug activity. The legislation, introduced by council members Wendy Culbreath, Claudia Klein, Brandon Leeth and Ann Morris, is designed to “shift the cost of the damage caused by the marketing of illegal drugs to those who illegally profit from that market,” according to a copy of the ordinance. The ordinance allows residents to recover between 25 and 100 percent of damages depending on the amount of drugs the dealer possessed or distributed at the time of the incident. It also allows drug users to sue drug dealers for the cost of drug treatment, but only if they report dealers to authorities six months before filing the action, and are clean for 3o days before the suit. On Monday, Klein moved to suspend the three-reading rule and approve the ordinance as an emergency, later adding that she hoped the legislation would be approved before a medical marijuana dispensary opens in Hillsboro in September. Councilman Justin Harsha said he would not vote in favor of suspending the three-reading rule because the ordinance had not yet been publicly discussed. 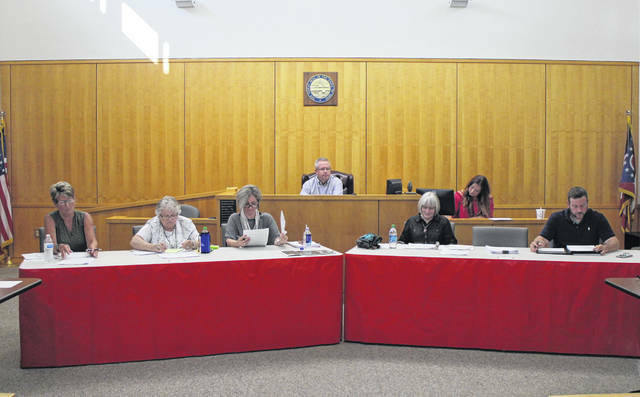 Council President Lee Koogler said the three-reading rule cannot be suspended without a unanimous vote, so if council wishes to approve the matter before September, it can approve it as an emergency next month. In other business Monday, council approved and adopted a comprehensive update of Hillsboro’s zoning code. The legislation was set for a third reading Monday, but Koogler said if council members wished for changes to take effect immediately, they could suspend the three-reading rule and approve the legislation as an emergency, which they did. Hillsboro Mayor Drew Hastings said in his report that the 2018 Festival of the Bells was a success in its inaugural year at Southern State Community College. The mayor said he enjoyed celebrating the birthdays of two women turning 100 and 102. Hastings thanked Morris, Buck Wilkin and a group of volunteers for placing flowers in baskets around town, and commended Chris Lewis for coordinating a fireworks display in the city. Hastings said free family-friendly movies will be shown at Liberty Park on July 20 and 27, and Aug. 10 and 17. A representative of the Clinton County Convention and Visitors Bureau recently told Hastings that a portion of the bureau’s $440,000 budget comes from tax dollars generated by Highland County residents who stay at hotels in Wilmington instead of Hillsboro. Hastings said Hillsboro could capitalize on that revenue if a new hotel is built here. The mayor offered condolences to the family of fallen firefighter Joe Patterson, who passed away recently after an accident at the Rainsboro fire station. Hastings also updated council on items discussed at a recent mayor’s conference, including medical marijuana dispensing, which Hastings said will likely not take off until it is legal under federal law. Hillsboro Safety and Service Director Mel McKenzie said in his report that a “green space” project on Gov. Trimble Place was set to pick up again later in the week, and will probably be completed by the end of the month. A small park and decorative facade set to be constructed in the empty Colony Theatre lot will likely have to be bid out, McKenzie said, and the Property Maintenance and Restoration Committee and the Community Enhancement Committee will have to provide him with a detailed design for the project. McKenzie said a proposed sports complex in the Railroad Street area will likely have to be bid out as well. McKenzie also thanked Hillsboro Police Chief Darrin Goudy and his department for providing security at the Festival of the Bells, and said the event appeared to run smoothly. Street and Safety Committee Chairman Adam Wilkin said in his committee report that the group recently went over proposed changes to portions of the city’s zoning code pertaining to animal control. Law Director Fred Beery is writing legislation on the matter for council’s consideration, Wilkin said. Wilkin also said his committee is continuing discussion on the Railroad Street sports complex idea and identifying potential funding sources. Hastings said the Hillsboro Planning Commission discussed a city master plan and zoning issues at a recent meeting. According to Hastings, the commission will hire a consultant to draft the plan, which will provide a long-term vision for the city. The plan will cost $56,000 over two years and will be covered by the commission’s budget, Hastings said. The mayor also said the commission discussed a zoning issue with a local resident who erected a pole barn structure that does not conform to the city’s zoning code. Hastings said the group is working on bringing the matter to a resolution. In the Finance Committee report, Chairman Justin Harsha said his committee is waiting on information from outside sources before meeting to discuss whether or not the city should join the Paint Creek Joint EMS/Fire District or continue utilizing its services on a contract basis. Council later entered executive session to discuss the issue. The official purpose of the executive session was to discuss contract negotiations and security matters. No action was taken. Civil Service and Employee Relations Committee Chairwoman Mary Stanforth said her committee is still waiting for a finalized draft of the city’s Civil Service handbook. Councilman Brandon Leeth’s absence was excused. • Heard a first reading on an ordinance establishing a Tax Increment Financing district in the area of PAS Technologies on Hobart Drive. • Suspended the three-reading rule and approved as an emergency an ordinance transferring a number of city-owned properties to Hillsboro’s community improvement corporation to be put up for sale. The revenue from the sales will be put toward the Railroad Street sports complex. • Suspended the three-reading rule and approved as an emergency two ordinances vacating alleys in town. • Approved a resolution increasing appropriations in the amount of $33,000 for mowing contracts. • Approved a resolution adopting a proposed 2019 tax budget for the city. Koogler said the resolution was a housekeeping measure.